Blue skies are back in Singapore! The prevailing winds have changed to the north-east monsoon winds, bringing with them the end-of-year wet season. The wet weather appears to have effectively extinguished the forest fires in Indonesia and with it, the haze is gone. It was a joy to see blue skies again, after so many weeks of miserable grey and hazy environment. 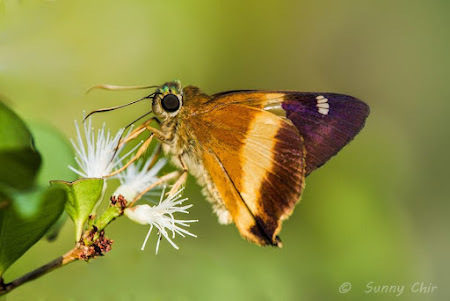 We often take our environment for granted, and the annual scourge of the haze from the massive land-clearing activities by just razing everything to the ground is over for now. 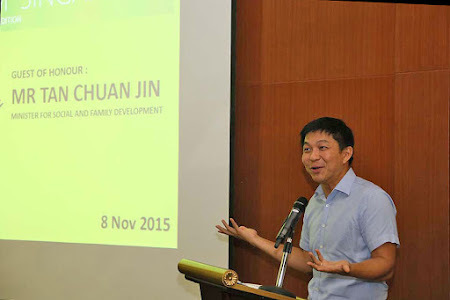 It leaves us wondering how effective the Indonesian government will be, come next year during the dry season, and when illegal land-clearing by burning starts again. But until then, we welcome our clear air again (and it has nothing to do with the Indonesian government, though they claim that they "provide" the clean air) and the cooler weather at the end of the year. 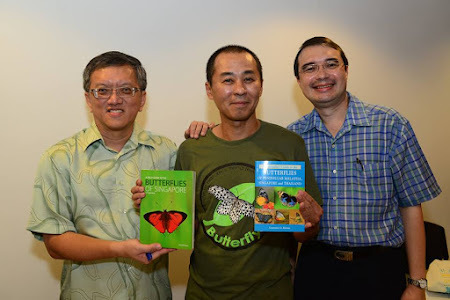 It was an exciting month for ButterflyCircle, as we launched our 3rd book - only possible with the collective effort of many members of the group. 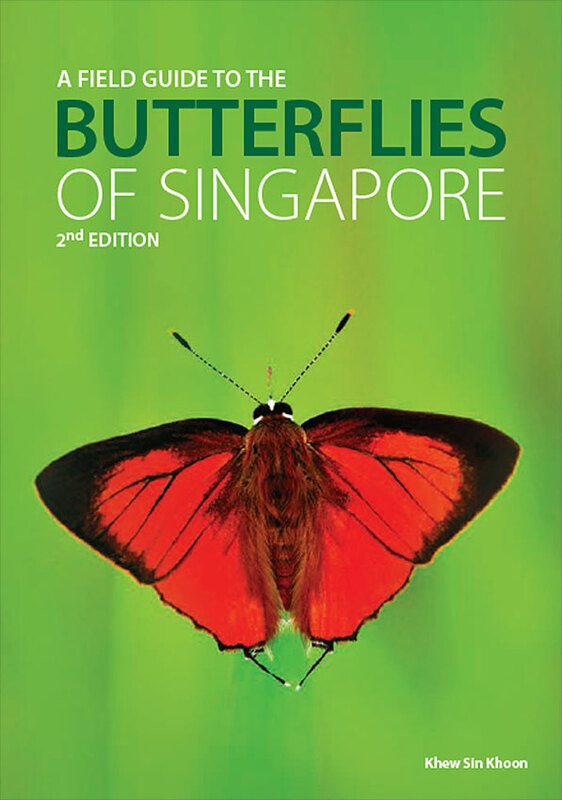 The 2nd Edition of the Butterflies of Singapore is now out, and hopefully the updated book will benefit more nature lovers who indulge in butterfly watching in Singapore. 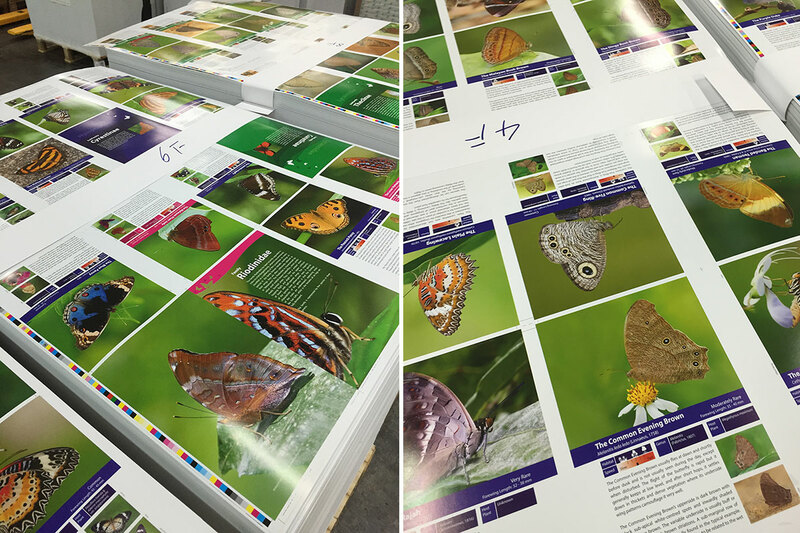 We are now preparing the material for our next book project, but that will be a subject for another time. On the global scene, the disturbing ISIS extremism reared its ugly head in the city of Paris, where many innocent victims lost their life. This is not Islamic nor does it have anything to do with any religion! No religion teaches its subjects to take innocent lives in its name. This is the work of madmen and people who have lost their souls, if they even had a soul in the first place. Now they are planning on taking everyone else. Let's hope that the superpowers will eliminate this group of heartless killers to make our world a safer place to live in. In my workplace, our "journey to the west" is complete, and about a 1,000 of us are now settled in to our new home at Westgate Tower. The logistics of moving such a big office was initially mind-boggling. 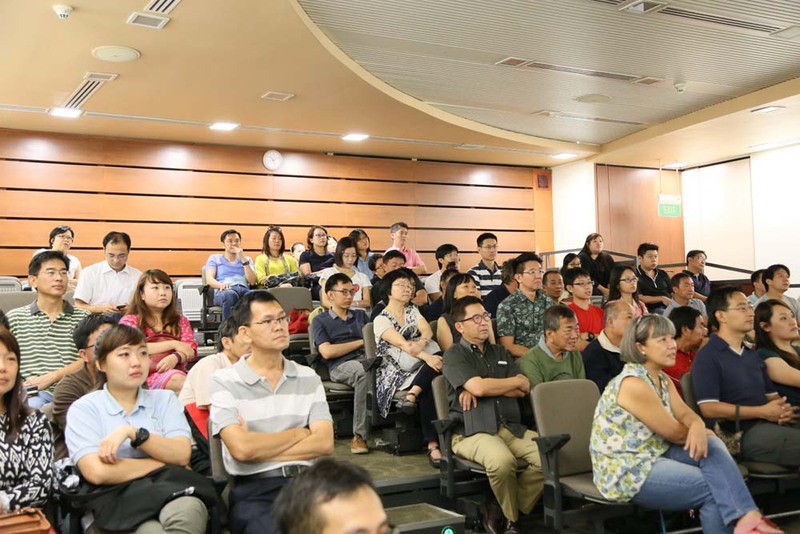 The travelling time for more than half of our staff increased by quite a bit, but it is an adjustment out of our comfort zone that everyone took in their stride. The Jurong East hub of malls and facilities is quite amazing, and we look forward to the future with renewed inspiration. The eleventh month of 2015 is almost over, and we feature a butterfly species from the family Hesperiidae. 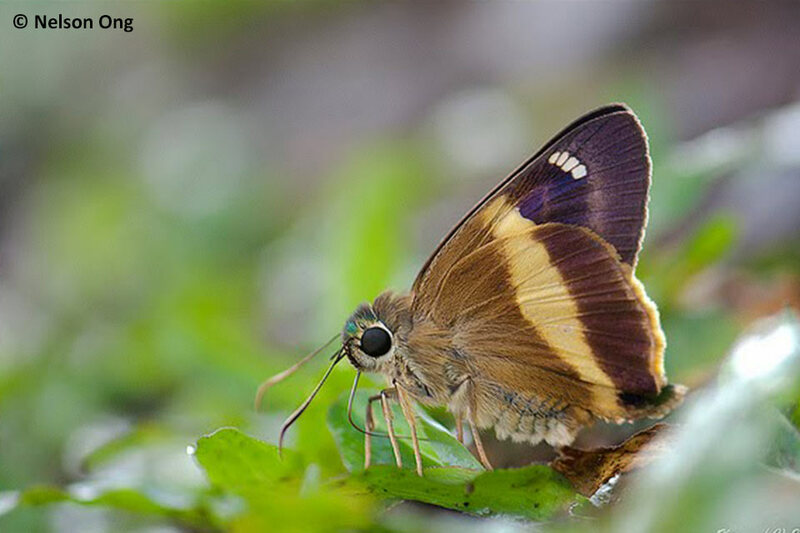 Skippers as we call them, are sometimes mistaken for moths due to their large eyes, fat and hairy bodies and the way they fly. 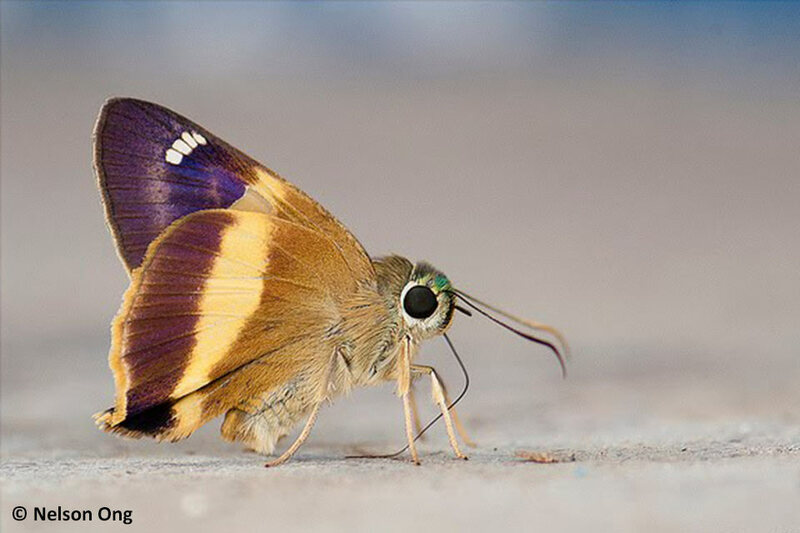 However, they are usually classified as butterflies rather than moths. Many species are crepuscular and are on the wing at dawn and the early hours of the morning, and at dusk. 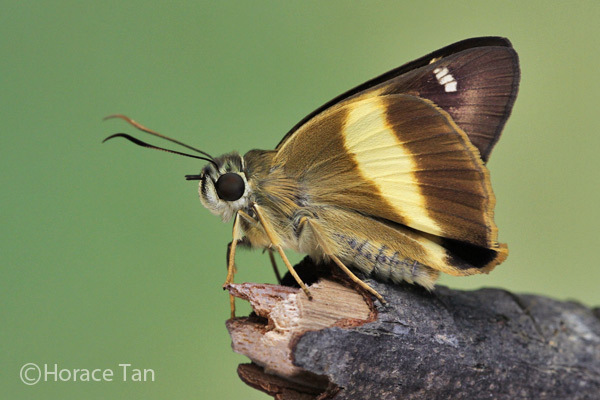 This month's feature butterfly is the Yellow Banded Awl (Hasora schoenherr chuza). This species is considered rare in Singapore, and is usually found in shaded forests in the nature reserves. 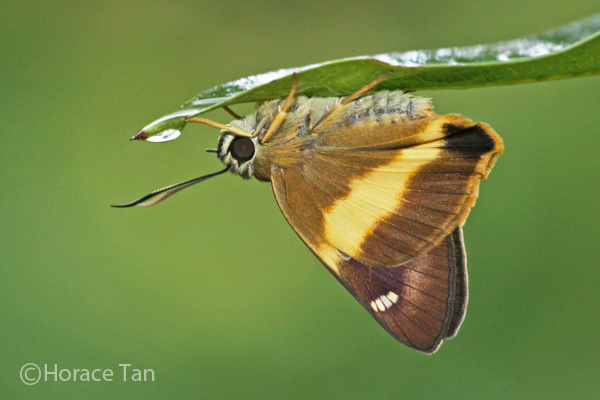 It is one of five species of "Awls" from the genus Hasora found in Singapore. None of them can be considered common but they are seen single from time to time, and when there are flowering plants in bloom. The Yellow Banded Awl is a plain dark brown on the upperside with four whitish sub-apical spots and several hyaline pale yellow spots conjoined to form an irregular band on the forewing. The hindwing features a broad yellow discal band and yellowish cilia . 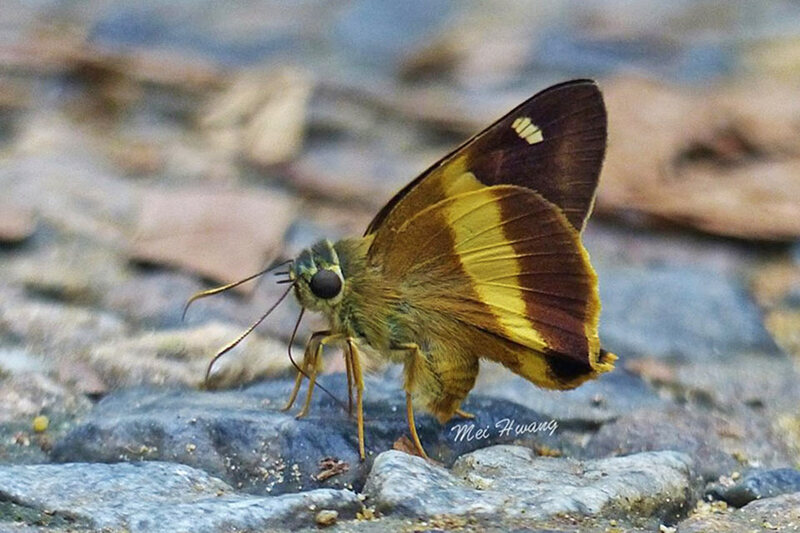 The underside is similarly marked but the wing base is a light golden brown. 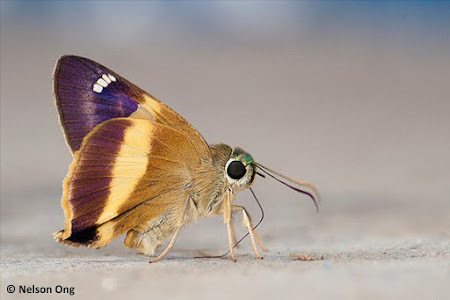 The apical area has a purplish sheen that is more prominent in some individuals, and also depending on the illumination in a side light. The butterfly is regularly seen in the vicinity of its caterpillar host plants, Spatholobus ridleyi and Kunstleria ridleyi, both vines that grow mainly in Singapore's forested nature reserves. 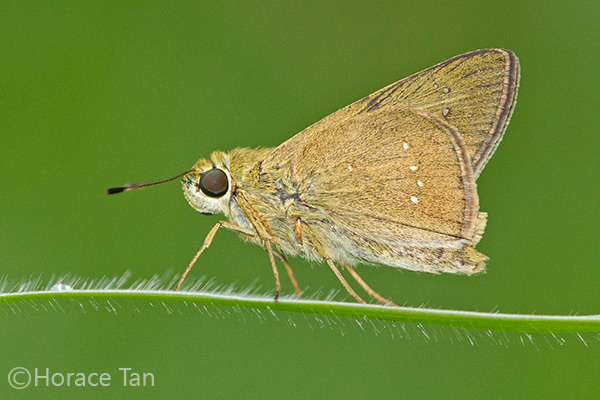 The Yellow Banded Awl flies rapidly, like most skippers, and is sometimes sensitive to the photographer's flash. Preferring the shaded understorey of the forested nature reserves, the butterfly has a habit of flying around speedily and then settling on the underside of a leaf to conceal itself. 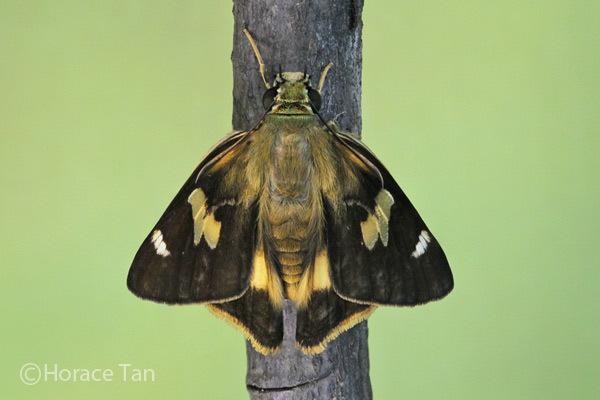 When disturbed, it takes off rapidly and then takes cover under another leaf, settling with its wings folded upright. 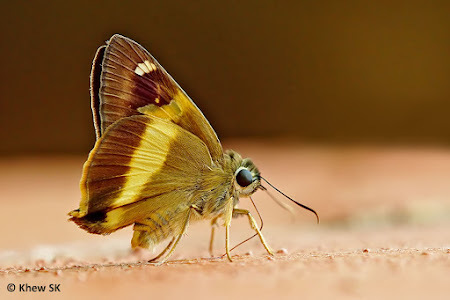 There are also occasions where the Yellow Banded Awl is observed to puddle on bird droppings and damp patches on tree trunks and walls of buildings. The caterpillar of the Yellow Banded Awl, especially the late instars, is quite spectacular and is almost as pretty as the butterfly itself! 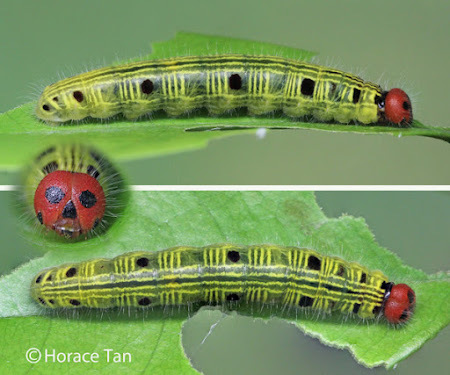 Its bright red head is quite attractive and unique. Caterpillar Local Host Plant: Brachiaria mutica (Poaceae, common names: Para Grass, Buffalo Grass, Dutch Grass, Giant couch, Scotch Grass). 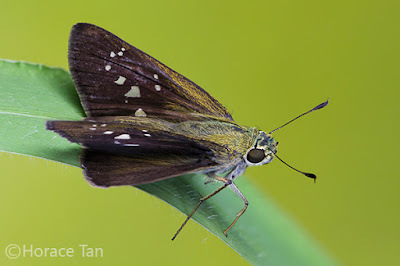 The upperside view of a male Bengal Swift. A close-up view of the forewing upperside of a male Bengal Swift. The lower cell spot is minuscule in this specimen. 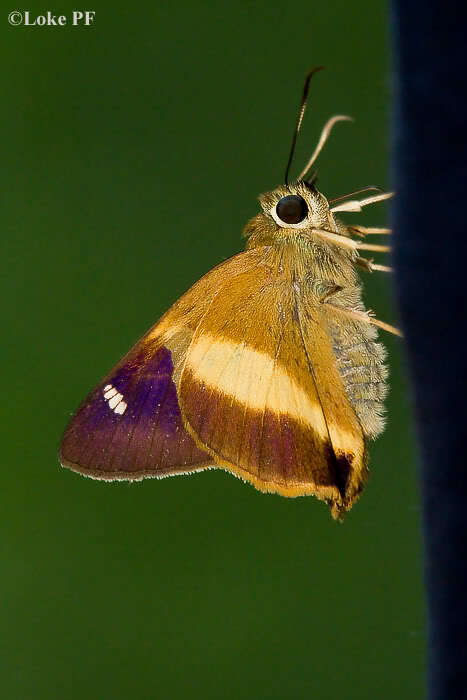 On the upperside, the wings are brown. 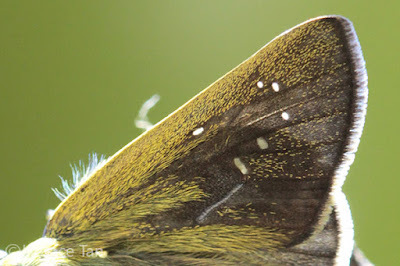 There are white post-discal hyaline spots in spaces 2-4, 6-8 and two cell spots in the forewing. The male has a narrow oblique brand in the forewing running from the spot in space 2 towards the dorsum (the brand is angled in such a way that a line drawn from and through the two cell spots would touch the brand at its lower end). 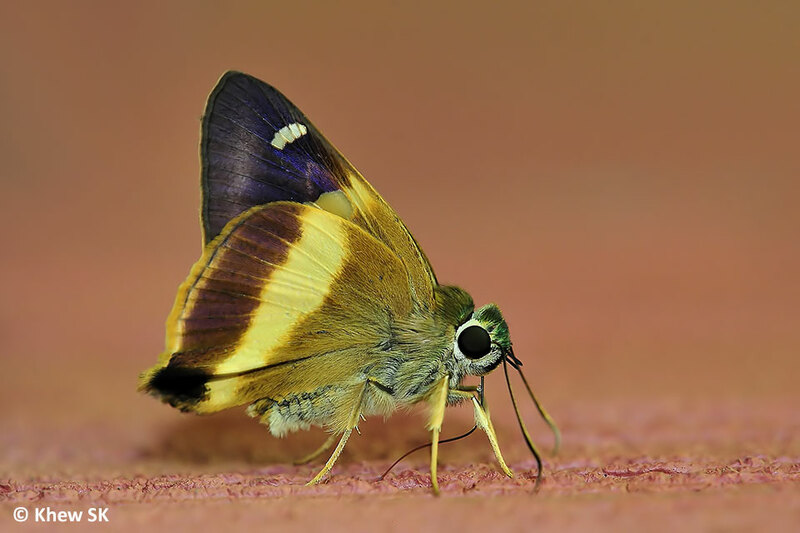 The female has additional white spots in spaces 1b, consisting of one minute upper spot and one larger lower spot. The line drawn the cell spots would typically pass far from the spot in space 1b. On the underside, the wings are ochreous without a greyish tinge. The forewing have the same spots as per the upperside, and the hindwing has a cell spot and a series of post-discal spots in spaces 2 to 5. The upperside view of a female Bengal Swift, showing the additional post-discal spots in space 1b. 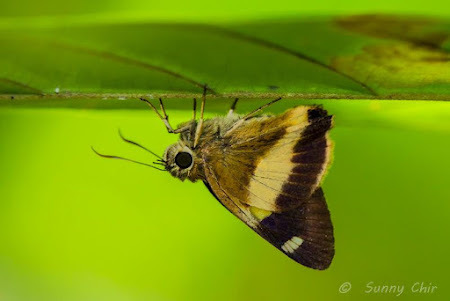 The underside view of the same female Bengal Swift in the above picture. 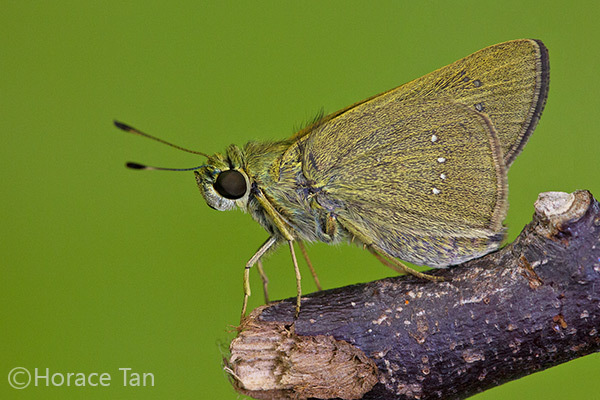 The Bengal Swift is moderately common in Singapore. 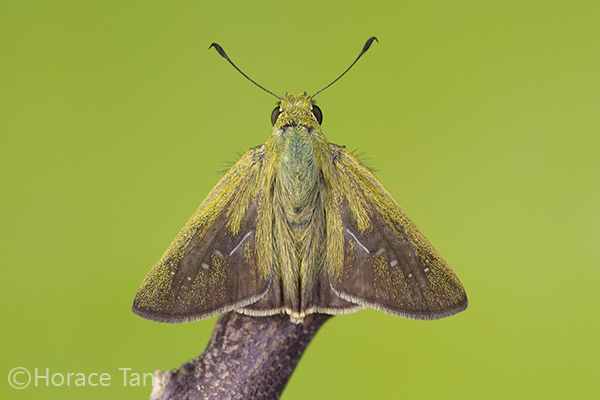 Easily confused with the similar-looking Small Branded Swift, the adults have been sighted at multiple locations including grassy wastelands, urban parks and gardens across the island. 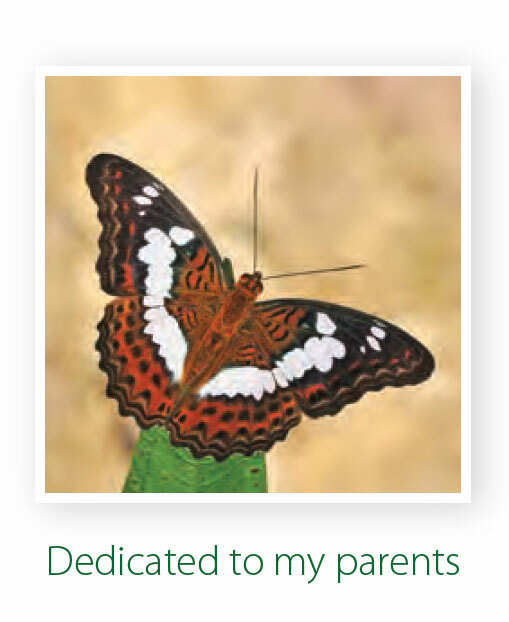 The adults fly with a swift, strong and darting flight. 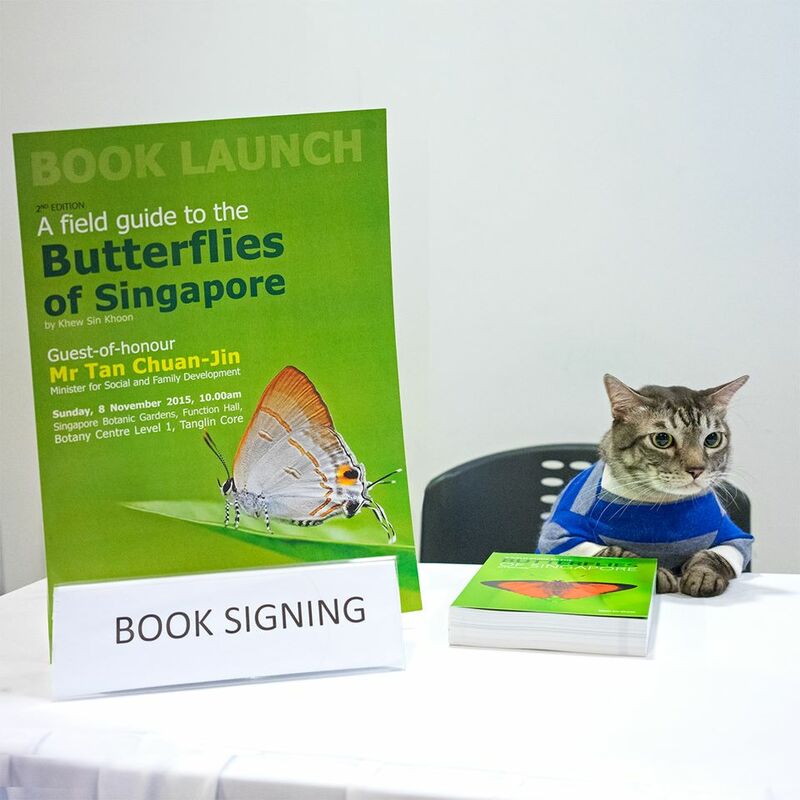 It has already been five years since I first launched the book "A Field Guide to the Butterflies of Singapore" back on 10 Oct 2010. 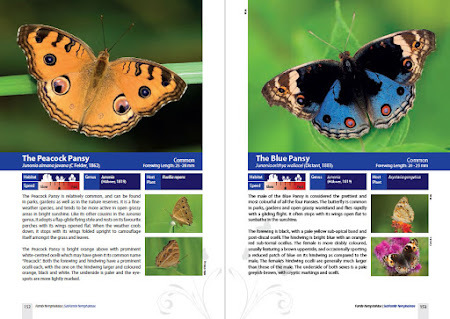 With the help from members of ButterflyCircle, we were able to compile a comprehensive field guide for butterfly enthusiasts and nature lovers alike. 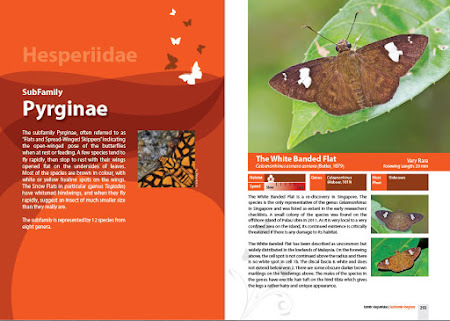 Five years down the road, further reviews of the species in the 1st Edition and additional species spotted in Singapore made it necessary to collate an update to the Field Guide. It couldn't have been a more appropriate year in 2015, Singapore's 50th birthday since Independence, to launch the updated 2nd edition as a gift to Singapore. 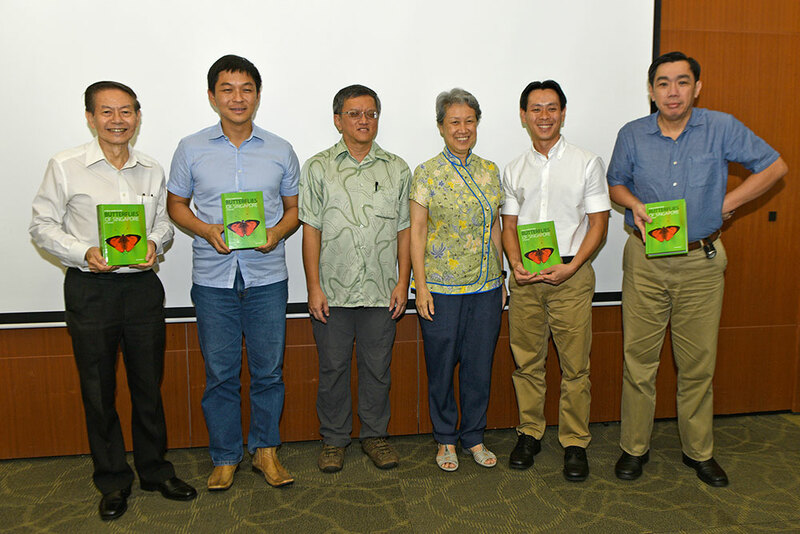 As with the original book, this sequel was generously sponsored by Ms Ho Ching, Executive Director and CEO of Temasek Holdings. A copy of the book will be donated free-of-charge to all schools in Singapore, polytechnics, universities, public libraries and other government institutions. 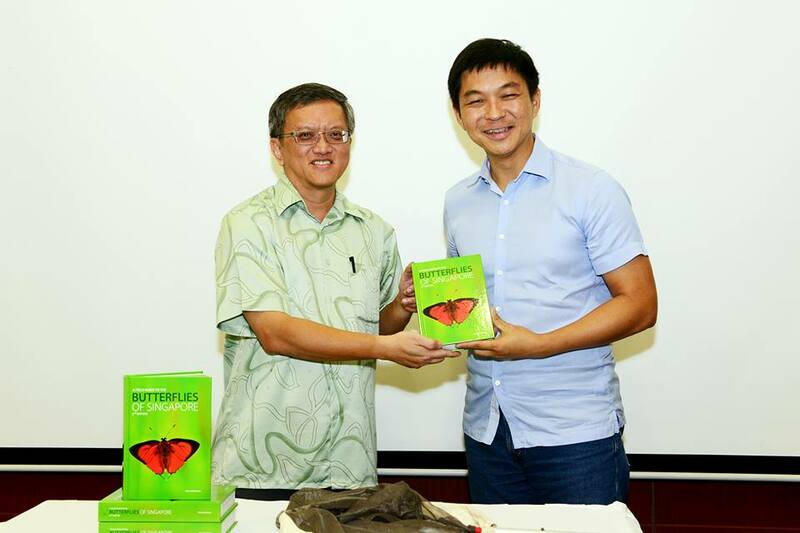 The intention is to make available a book on Singapore's biodiversity and natural heritage to as many Singaporeans as possible, with the hope that our present and future generations will be motivated to treasure, love and conserve our flora and fauna. 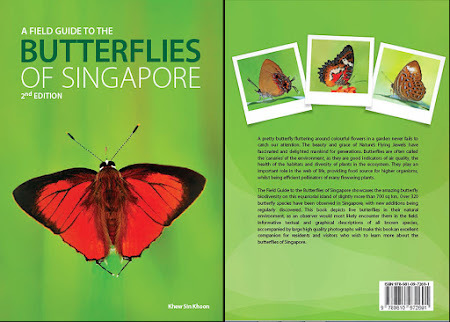 Given our very limited land, Singapore has done admirably well in the conservation of our biodiversity. 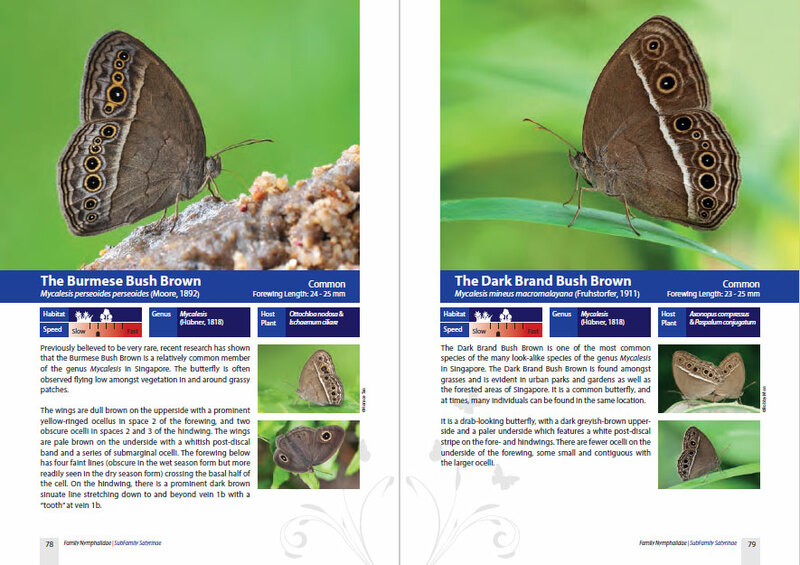 And so the work started in earnest in early 2015, sorting out photos, re-doing the write ups, correcting errors and typos, changing some of the details like wingspan to forewing length, creating an index to replace the checklist and updating taxonomic information and names where latest information were available. 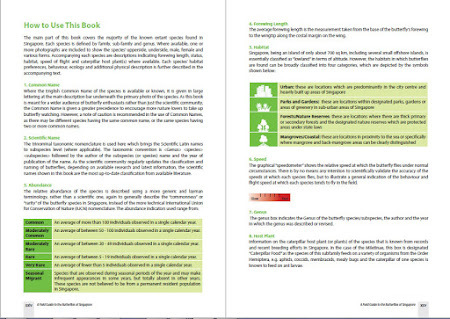 Some of these changes came from feedback from users of the book and reviews by other authors. Due to my work commitments, much of the effort in the updating of this 2nd edition was done in my free time, late into the nights and on weekends. As the progress speeded up, our layout artist from IOP Communications, Cressindie, had to do overtime work in the evenings and on weekends. The initial progress took quite a bit of time, as there were many changes and amendments upon amendments made to many pages. I had the fortune of having two very sharp-eyed ladies to help me with the proof-reading this time around. 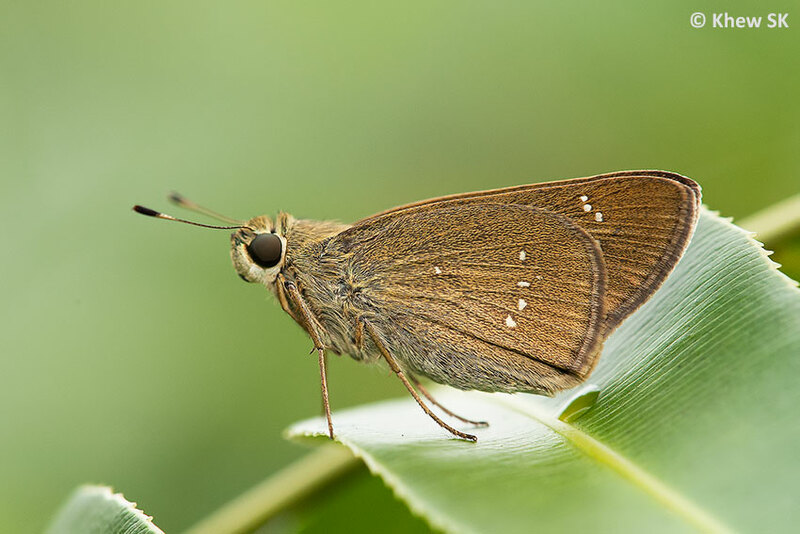 Their amazing ability to pick out the smallest of details helped eliminate quite a number of errors that were not even noticed earlier. So a very big thank you to Mei Hwang and Yun Lim! Another source of help came from Dr Seow TL whose wealth of experience and detailed eye for butterfly identifications also made the book a lot more accurate and complete this time around. 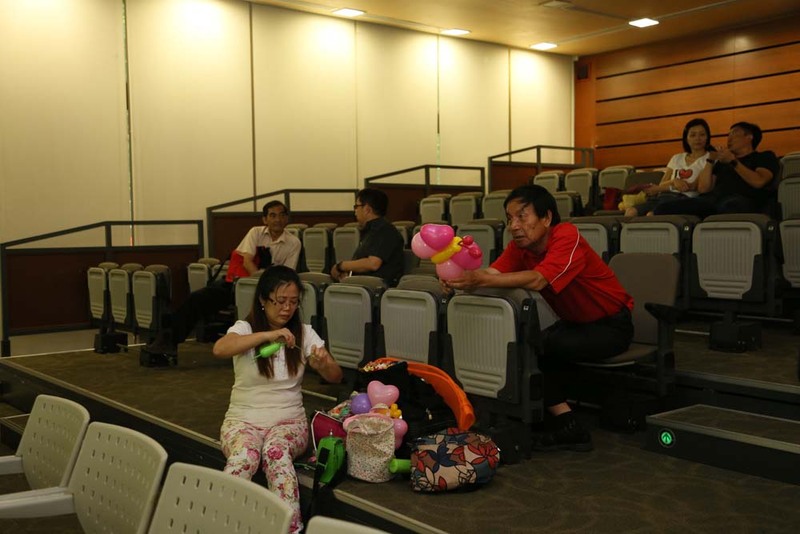 As the days and weeks flew past, my capable "project manager" Alicia Tan of IOP made sure that every thing was on track. 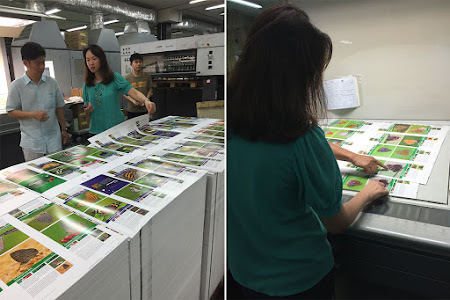 She helped in the QC of the book and advice in the technical details of printing the book. Kudos also to Sherman Chia of NPE Print Communications Pte Ltd (also the same printers for the original book) for delivering everything on time. Those who attended the launch of the book on 8 Nov may not have realised the organisation of the logistics and planning behind the scenes. 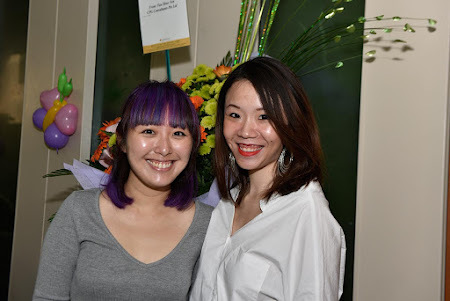 My sincere appreciation goes to my two colleagues, CJ and Xueyan who volunteered to help with the launch collaterals, logistics, organising the reception and MC'ing on the day of the book launch. 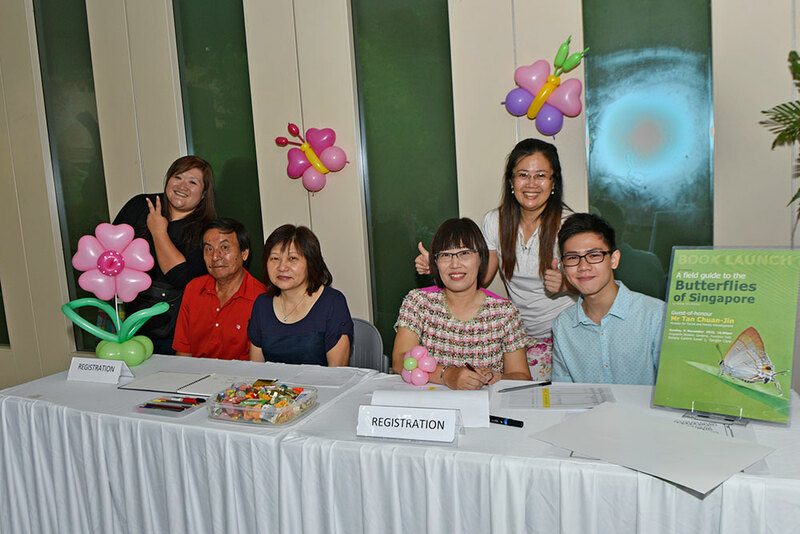 Special thanks also to ButterflyCircle members and Seletar CC members who turned up in force to handle the registration, ushering, photography and keeping the event running smoothly. A word of appreciation to the caterer, Orange Clove Catering, and their service staff for doing a good job of serving the guests at the launch and for their yummy food. The weather on Sunday 8 Nov was just perfect. Our day started early as we headed for the Function Hall at the Singapore Botanic Gardens where the launch was to be held. 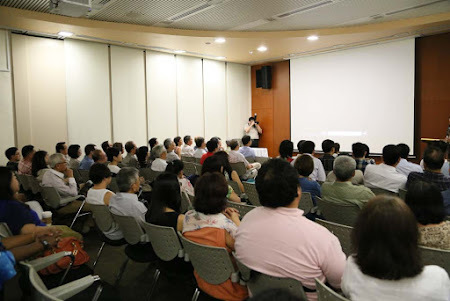 This was the same venue where the first book was launched, and there were many fond memories of the place. 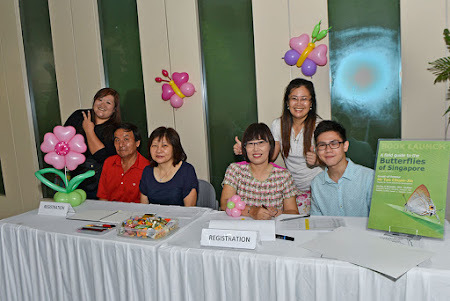 Our helpers were up early too, and everyone was ready to go before the guests arrived. 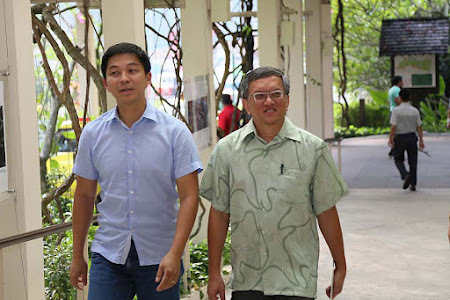 Our Guest of Honour, Minister Tan Chuan Jin, Minister for Social and Family Development, was his characteristic down-to-earth self when he arrived a lot earlier than expected. Being one of our most approachable Ministers, he chose to mingle with the crowd rather than stay cooped up in the VIP holding room. My sponsor, Ms Ho Ching also arrived early, and chatted with friends and guests. 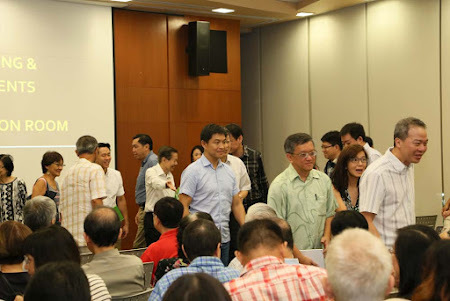 The event progressed smoothly and as a small gesture to minimise paper usage, all our speeches were read off digital devices minus any printouts. 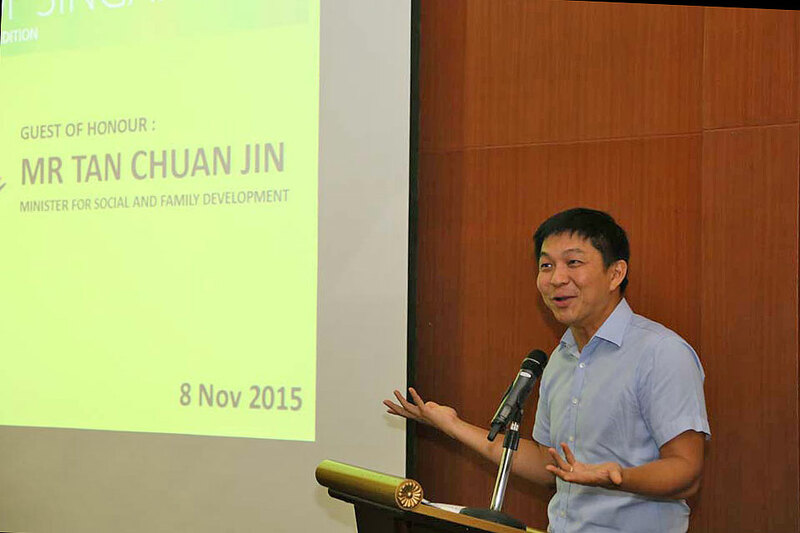 Minister Tan was his casual self and spoke eloquently from the heart. 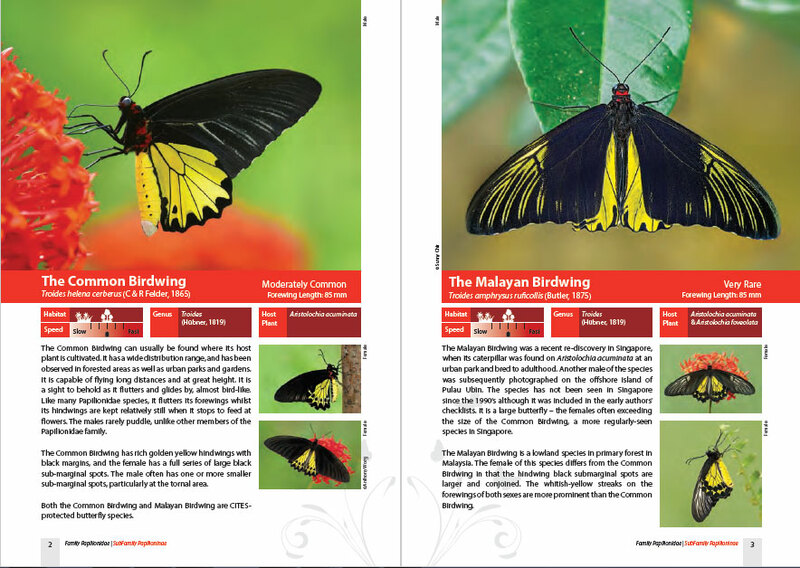 For this 2nd Edition, special charity hardcover copies were printed and donated to three organisations - ACRES, Lee Kong Chian Natural History Museum and Garden City Fund. These special copies will be sold at a charity price of S$200 at a forthcoming charity event to raise funds for these organisations which focus on animal welfare, nature education and research, and the greening of Singapore. 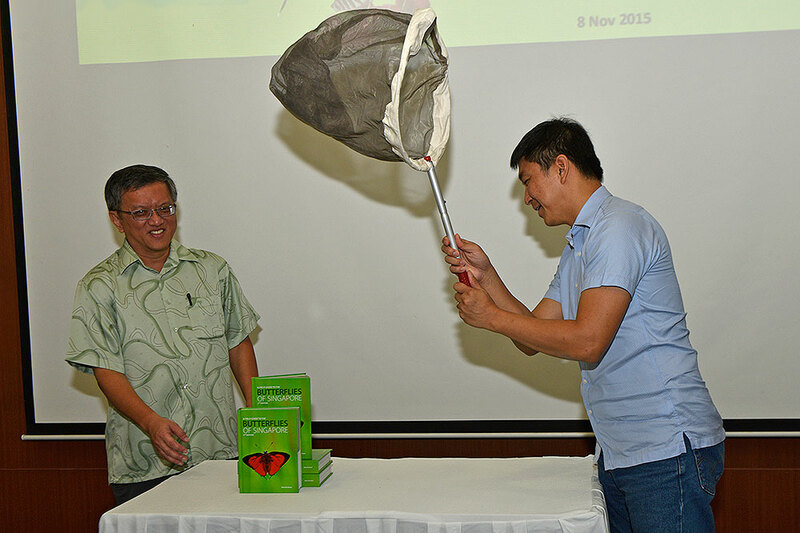 Minister Tan launched the 2nd Edition of the Butterflies of Singapore by lifting a butterfly net off the books to "release" the butterflies. 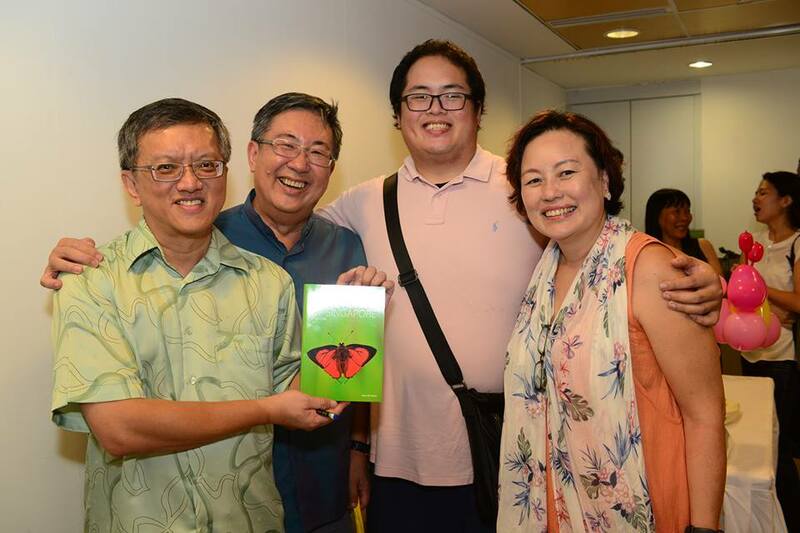 Ms Ho Ching did the honours to present the token copies of the charity edition to Prof Leo Tan (GCF), Prof Peter Ng (LKCNHM) and our newly-minted Member of Parliament Louis Ng (ACRES). The reception after the launch was a good time for networking and catching up with old friends and making new ones. 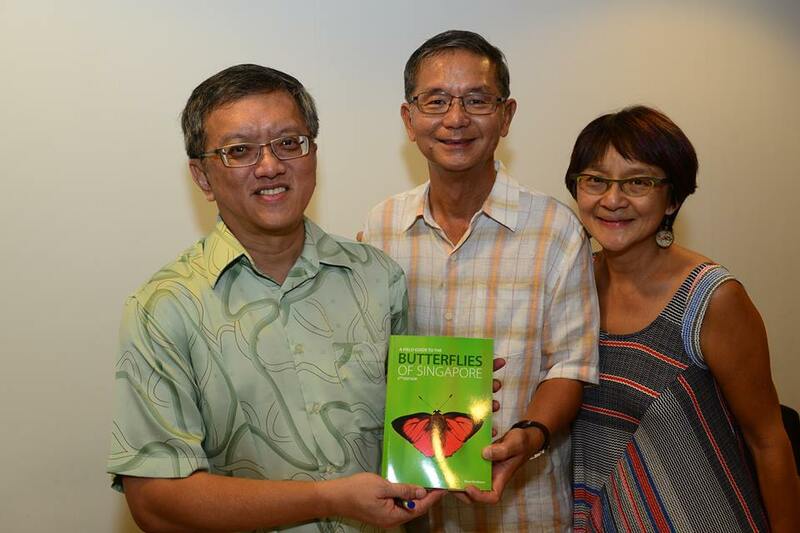 I was also touched by the number of overseas guests who took the trouble to attend the book launch - my bosses and colleagues from Beijing, Dr and Mrs Kirton from KL, Mr and Mrs Joseph Goh from Penang Butterfly Farm (now called Entopia), my friend Dato Chang of Ecoworld, ButterflyCircle members Antonio and his family, and LC Goh who flew in from KL just for a few hours before flying back home! 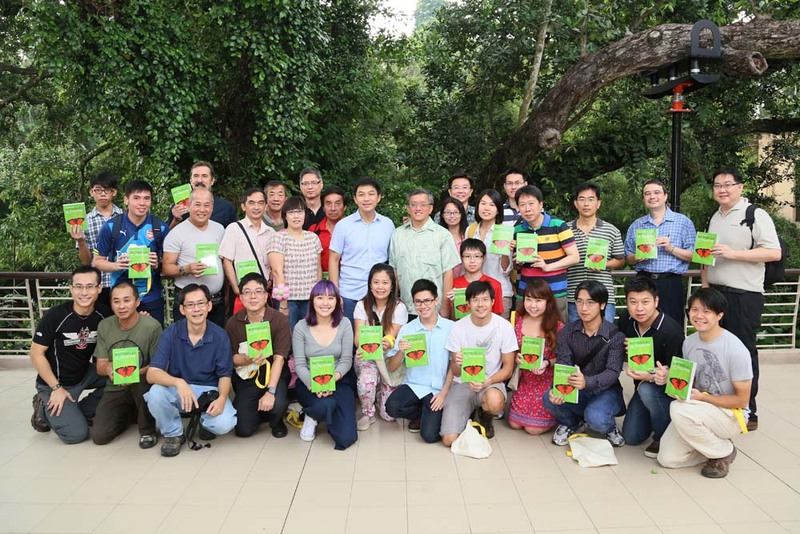 And then my friends from the nature circles, my colleagues and close friends made up the rest of the crowd. A big thank you to all of you for taking your Sunday morning off to be with me. I am indeed humbled by your presence at my book launch. The 2nd edition features a number of better photographs to replace the photos of the first addition, as well as 29 totally new species that have been observed over the past 60 months after 2010. 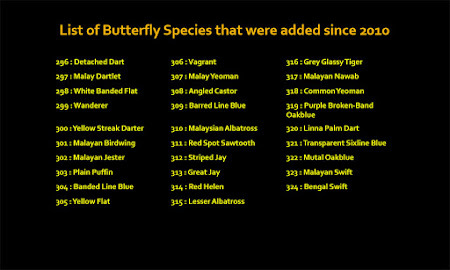 Some species are new discoveries and have continued to stay in Singapore, whilst some are seasonal migrants/vagrants. 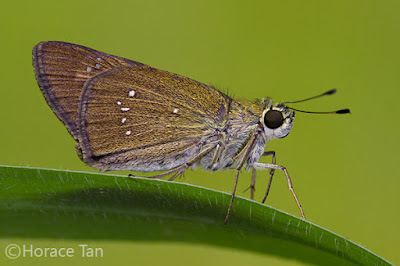 A small number of species, particularly from the Hesperiidae and Lycaenidae may have been extant in Singapore all this while, but their positive IDs were only recently validated through close research via early stages (by Horace Tan) and having voucher specimens to scrutinise. 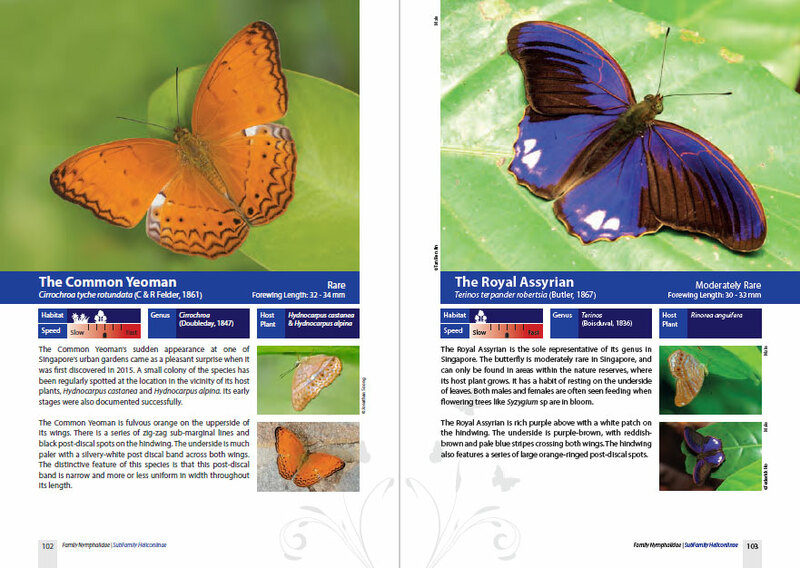 Amalgamation of all the species from the Subfamily Morphinae into the Subfamily Satyrinae. 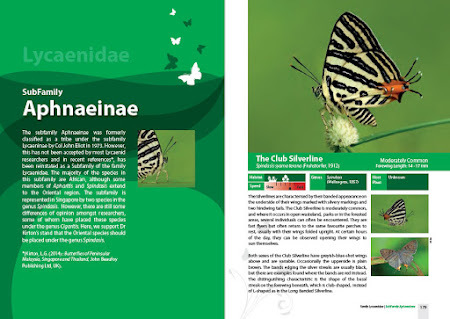 Reorganising the Subfamily Lycaeninae, and raising the tribes that were formerly lumped under the Lycaeninae to full Subfamily status. 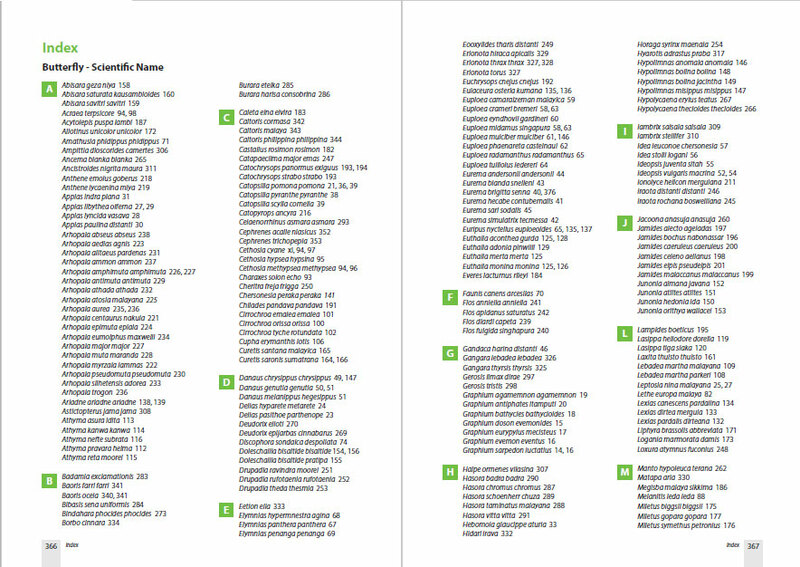 These reinstated subfamilies are Aphnaeinae, Polyommatinae and Theclinae. 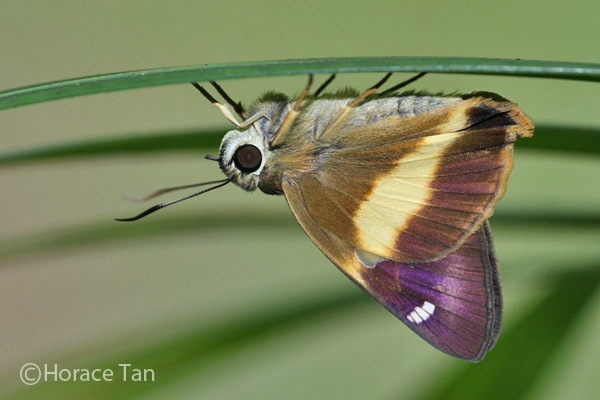 There is now no longer any representative of the Subfamily Lycaeninae in Singapore. 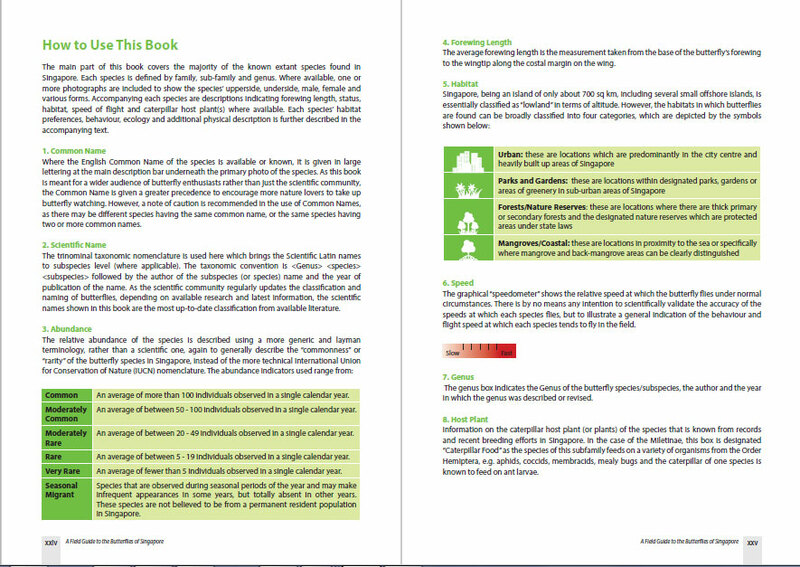 Resulting sequence of genera and species of the various Subfamilies are also reorganised according to Dr Kirton's book. 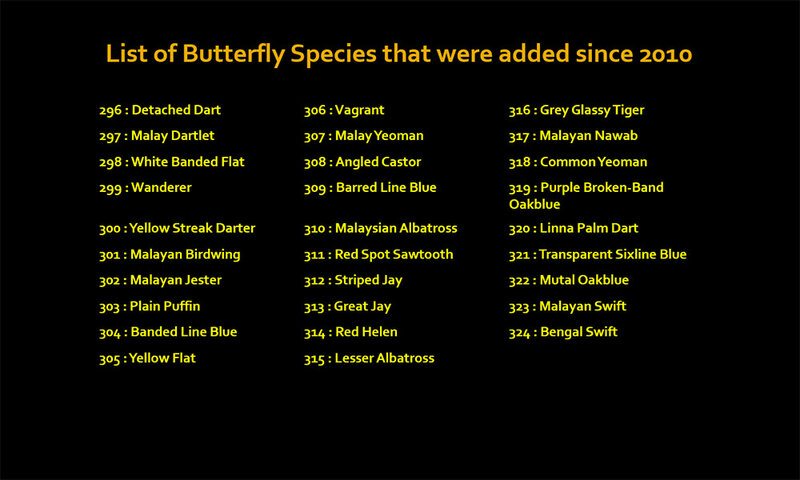 All species featured have their wing dimension data now recorded as forewing length. This was a suggestion by Dr Albert Orr in his review of the book, and this convention has been taken as the preferred norm in most recent literature on Lepidoptera. 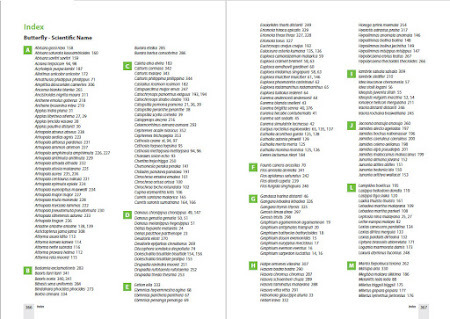 An index has now been included at the back of the book. This was a result of many user feedback that an index would be more useful than a checklist when looking for specific species. 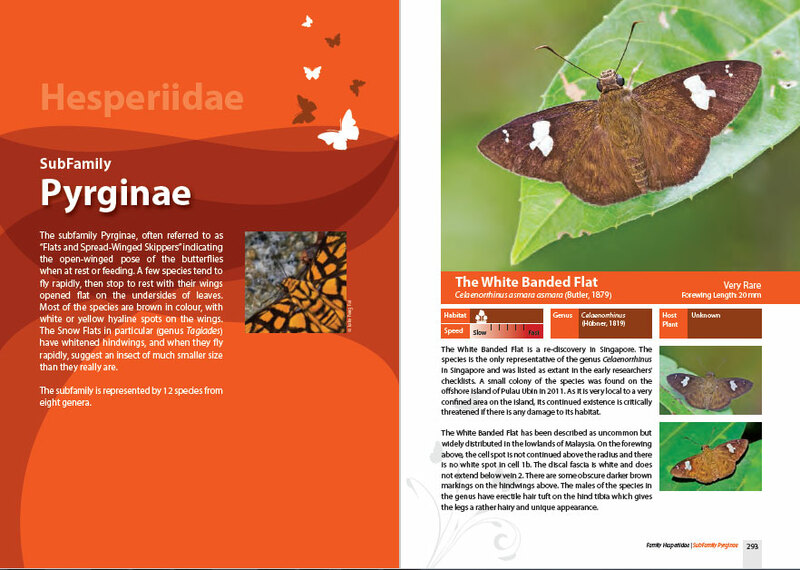 The index is organised under three sections of Butterfly Common Name, Butterfly Scientific Name and Plant Name. As with books of this nature, there is always a likelihood of some errors, despite the huge effort made to be as accurate and error-free as possible. 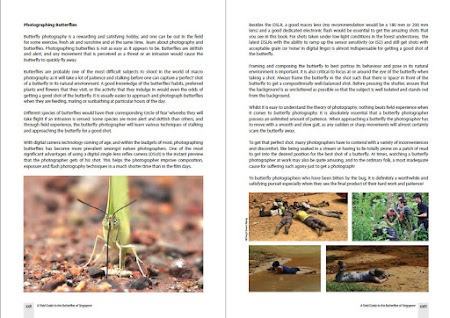 In the event that there are any inadvertent errors found, I humbly apologise for these oversights. And so this new book from our group, ButterflyCircle and friends, is added to our collection, making it our 3rd book since 2010. 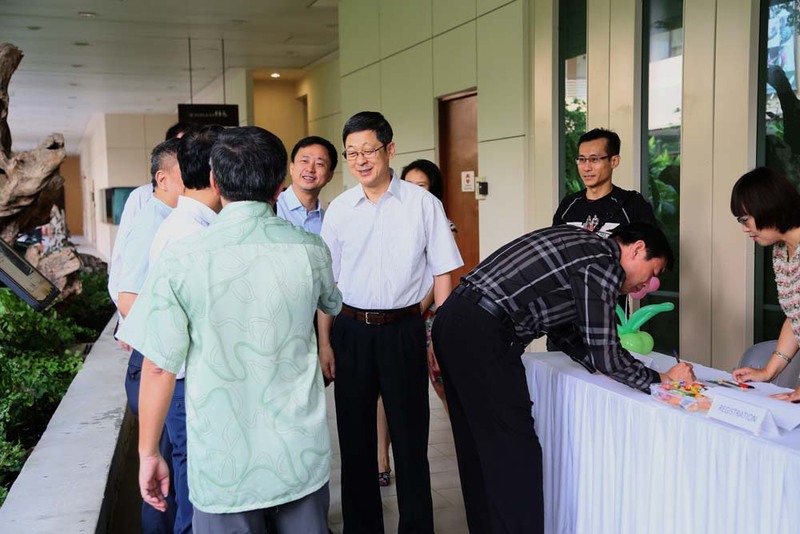 We now look forward to further projects to help in nature conservation and teaching our future generations to care and nurture our biodiversity and conserve nature on our little red dot of only 720 sq km. 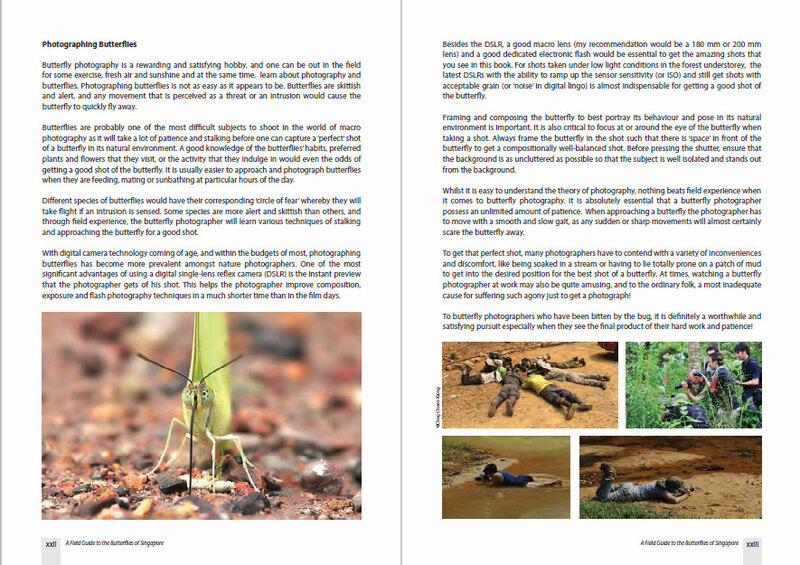 Text by Khew SK : Photos by Ray Chua, Loke PF, Bobby Mun, Tan Ke Yang and numerous other photographers using their smartphones!